What is the Gun Gum Easy Fit Metal Repair Bandage? Wherever the damage is on your exhaust, Holts has a Gun Gum product that can fix it. The Easy Fit Metal Repair Bandage is an exhaust repair kit from our Gun Gum range containing an adjustable wrap which can be fitted to bends in sections of exhaust or where a silencer box meets a pipe. Thanks to the special flexible design you can fix those tricky areas with ease at home. The wrap fits tightly and should be sealed with Gun Gum Paste to form a permanent gas tight seal, with no dismantling or replacement parts needed. Suitable for use on curved pipes, catalytic converters, DPFs, backbox or tailpipes. 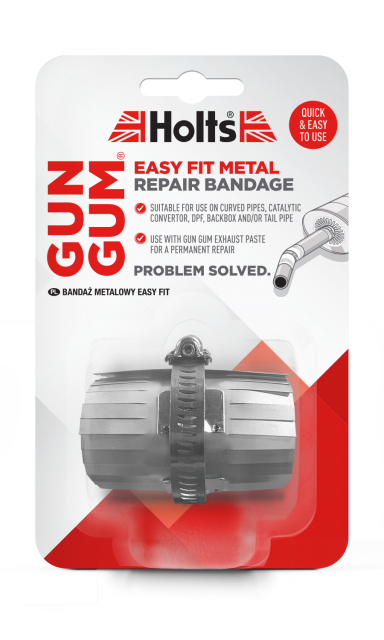 Repair those difficult areas of your exhaust easily with the Gun Gum Easy Fit Metal Repair Bandage.